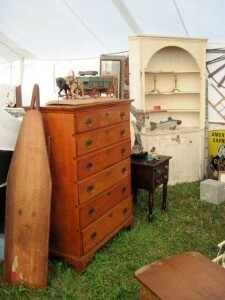 BOUCKVILLE, N.Y. — More than 1,000 antiques and collectibles dealers gathered for varying times during Madison Bouckville Antique Week August 15–21 to set up their collections in this tiny crossroads village, which began with one show in 1972 and has several independent fields today hosting dealers. Using a camera drone, Jim Dutcher, the promoter of Cider House Antiques Week, took this image that captured most of the fields late in the week, showing his field in the foreground and looking east from there, with Route 20 diagonally from the right to the top of the image. The Big Field is at the top right corner. Cider House’s field opened on Monday, August 15. 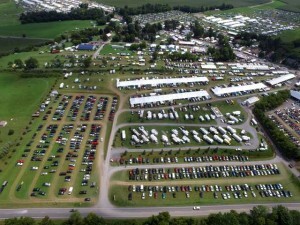 One of the features that attracts shoppers is a huge parking lot at the back of the field with free parking. One of the dealers here was Mario Gauthier, Auburn, N.H., who was very pleased and reported having a great show. His collection is hundreds, even thousands, of small antiques in silver, glass and porcelain from Europe and Asia. Many of his customers would enter his booth and study the merchandise for quite a while, picking several pieces to purchase before leaving. At one point Wednesday afternoon, there were four buyers doing business at the same time with no fewer than a dozen articles selling. Darlene Bullard, Hamilton, N.Y., was taking great pleasure educating visitors about her collection of Anri, handcarved wine bottle cork and wood stoppers in the form of cartoonish figures, all from Italy. At the show she was offering several hundred, along with clocks and music boxes. Bob and Marge Rolls, West Seneca, N.Y., were offering early Twentieth Century glass. Comprising primarily Depression glass, offerings numbered enough to fill several dining rooms; an assortment of toleware trays was also on display. Handz of the Past, Utica, N.Y., was showing handcrafted clock housing from the Twentieth Century, with intricate detail. Julie’s Place Antiques and Collectibles, Endwell, N.Y., sold one of the largest coffee grinders available, with a turning wheel about 3 feet in diameter and weighing more than 200 pounds. The dealers were also selling furniture from mid-Nineteenth Century, some of it manufactured in New York. Jefferson, N.J., dealer Sandra Perry was offering mahogany furniture from the Edwardian period. Some of the exhibitors at Cider House were selling the popular styles seen in today’s decorating. Ed Correia, Sterling, Conn., has been offering steampunk lamps and lighting for several years now. He also sold a watchmaker’s bench in excellent condition. And there was more. Alexander’s Antiques, Syracuse, N.Y., was featuring rococo-style furniture from the Nineteenth Century. Jerry Kline, Knoxville, Tenn., was in his usual place here, having brought pottery, clocks and boxes made in America and England. 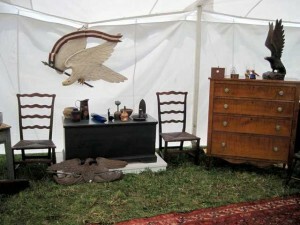 Douglas Brinkley, Germansville, Penn., offered his mixed assortment of collectibles and antiques. One of his best deals he said was a Kicking Donkey pull toy from Alderman Fairchild Company, in very good condition. Field manager Jim Dutcher in a post show conversation said, “The show was a great success for my dealers for the week. We opened on Monday morning with about 250 exhibitors in place and weather cooperated all week. Sales were very good; we were happy!” Look for Cider House to lead the week again next year or stop by Cider House Antiques Shop, as it is open year-round. Among the many shows also opening Monday was Expo, which is among the larger shows. 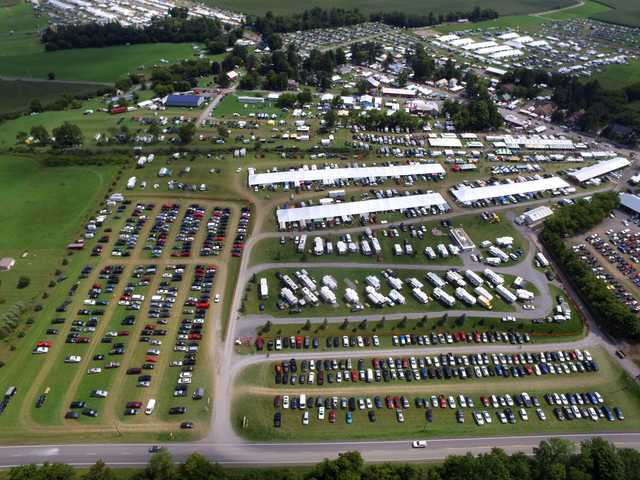 Managed by Mark Peavey and his family, Expo boasts more than 120 exhibitors in large tents set parallel to the road just two rows deep, with parking behind them; all at the front of a farmer’s cornfield. According to Mark, this arrangement has been ongoing for more than 20 years. Ron Stayer of Wishing Well Antiques, Lowman, N.Y., has been in about the same place on this field for many years with a collection that he spends most of the year assembling. Country style is his passion, and in woods native to northern New York, Nineteenth Century pine is prevalent here. This summer he offered a dry sink, a commode, nicely restored, having one drawer with a single door; several one- and two-drawer stands; and a great deal more in furniture. His collection also included local earthenware and stoneware jugs and kitchen pieces. A couple from Alton Bay, N.H., Steve Temple and Linda Davis have been exhibiting together here for many years as well. Their merchandise is primarily the little things that were found in the home 150 to 250 years ago in northern New England. There was an extensive collection of stone crockery. “All in the best condition and from New England,” according to Steve, and it was selling rather well. The Thompsons from Cape Porpoise, Maine, were offering very small things. Glynis was busy selling little sewing notions from her showcase and more. Schoenly Antiques, Glen Ellen, N.Y., and Gregory Antiques, Morris, N.Y., both specialize in early American lighting — whale oil, kerosene, alcohol, candle and such — which was filling a half dozen tables in their exhibit area. Further, both these dealers could tell all the specifics about the special manufacture and uses of the lighting. David Zabriskie, Lake Placid, N.Y.
Mike Gallant, Hometown Antiques, Glenburn, Maine, was having a good time this week. Among his specialties are Nineteenth Century marbles: special glass ones with extra detail in their color or making. Here he meets with many once-a-year collector/buyers for just this, and he was also selling more of his Maine-found household antiques. Quaker Acres West had more than 100 exhibitors on the north side of Route 20. Jim Bleazey, Vestal, N.Y., had a full tent here but also offered an early one-horse open sleigh in good operating condition, only missing the horse. John Lord, Wells, Maine, had a very large exhibit of Nineteenth Century advertising and small store fixtures. The next field to the west is Butternut Hill. Seen here were two Vermont dealers side by side. John Lawrence and his son Jason from Barre, Vt., were doing quite well with the sale of furniture from the late Victorian and early Edwardian periods. Their neighbor, Ed Lambert, St Albans, Vt., was offering American-made oak and maple furniture in the Larkin style. The Out Front Show Field is just as the name implies, out front of the Big Field, on the south side of Route 20, close to Landmark Tavern. It occupies the backyards of numerous houses with several places where there is access to the road, and it is big enough for more than 100 exhibitors. Front and center here were Ken Cosselmon, Syracuse, N.Y., with Oriental rugs, while Bill and Kay Puchstein, El Jobean, Fla., were among the exhibitors at Indian Acres, showing a large selection of Nineteenth Century painted furniture. The Big Field Antiques Show opened Friday, August 19, and ran through Sunday, with more than 250 exhibitors, most in the large tents but some in their own tents surrounding the field. This is the field that is known as the original show which started it all, even though management is now in the hands of Steve and Judy Allman, Allman Promotions. This show has many exhibitors Steve has been able to keep from the early days of Madison Bouckville, but he and Judy are working to bring in more exhibitors fresh to the show. Marc De Salvo, West Mifflin, Penn., has been at the Big Field for many years, with furniture and fine art running the gamut of design and style selections, from late Nineteenth Century stained glass windows to Hudson River School paintings, Victorian-era furniture, as well as the Colonial and Georgian period. Marjorie Nellenback Antiques was selling fine art glass. The collection she brought from her home in Ava, N.Y., included Steuben and a selection from various European makers. Coming from Palmyra, N.Y., Michael Haskins could bring his entire inventory to the show in a compact car, so long as it was well insured. He was offering a selection of very special but not very big antiques, including several sets of 250-year-old andirons, an assortment of small but very old Persian and Caucasian tribal rugs, fine art and small accessories from the Revolutionary War period and before. Blue Bird Antiques, Atlanta, Ga., is the partnership of Diane Gass and Caralie Knable, whose combined collection was popular here, with sales in jewelry, collectible dolls, late Nineteenth Century hats and an assortment of inkwells and desk accessories. 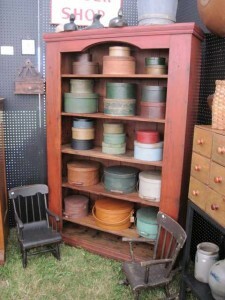 Carrie Eck of Sunflower Antiques, Lebanon, Conn., was thrilled with the results of her efforts. She reported more than 35 sales for the weekend, including an early Nineteenth Century painted table. The bulk of her sales were small accessories but still making it a very successful show for her. George McClosky, Lynbrook, N.Y., loves clocks and he had more than 200 years of examples here, ranging from weight-driven clocks from the Eighteenth Century made in England to a plastic-faced Rheingold Beer advertising clock that could have been hanging over a bar in the Bronx. He does the restoration as necessary so that he can sell a clock with assurances as to its working condition. Peter D. Murphy, Bath, Maine, sells very traditional early American furniture and accessories in a mixture of soft woods and hard woods with just a trace of European mixed in, for good measure. Murphy has also learned to add smalls to his stock for customers who are not quite ready to buy the big pieces, so that helped his sales total this weekend. Wilori Lane Antiques, Rochester, N.Y., is run by a couple with full-time jobs who shop on the weekends and evenings. Their merchandise is primarily Nineteenth Century pine, oak and maple from New York and also a great collection of oil on canvas paintings in the Hudson River School style. Their sales were good as they kept rearranging their exhibit to accommodate losses due to sales. Kay Baker, Amherst, Mass., was having a similar problem. She sold an American Pembroke table early in the show leaving her with two Jacobean chairs in the middle of a Nineteenth Century Caucasian tribal rug. Next the rug sold. Soon the chairs were gone and so it was that the center of her space was empty. Then she also was selling smalls. That’s the way it was for Friday and Saturday, big crowds and good sales. Sunday the weather was threatening and in fact there was rain in the early afternoon, reducing the crowds on this last day of the big week. It would be fair, however, to say that the weather gave all the fields a good opportunity for great sales. Next year the week will again be the third week of August so mark your calendars for August 14–20 and be sure to book hotels early for there will be big crowds, lots of visitors and great shopping here. For more information, the Big Field Antiques Show is at www.allmanpromotions.com; Cider House is at www.ciderhouseantiques.com and the group is www.madison-bouckville.com.